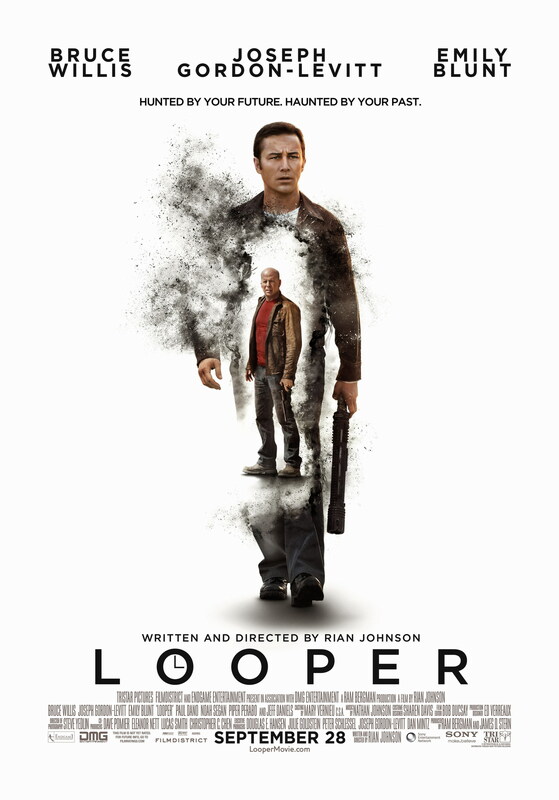 Synopsis: Joe (JGL) is a Looper, someone who’s hired to take out people who are sent back in time by the criminal underworld, but runs into some trouble when he’s tasked with taking out his older self. Review: Time travel movies can be a risky endeavour, as the Doctor himself will probably tell you, the timelines can get very messy and the plot can get very confusing, which might make the viewer’s brain start to hurt. Fortunately, there’s no need to worry about your brain melting here as writer and director Rian Johnson delivers a very sharp screenplay and a very riveting and thought provoking story in equal measure. Yet for Joe, things go a bit awry as he’s faced with his older self, and he can’t bring himself to kill himself, and as a result, a hunting game begins. The screenplay by Johnson is tremendous, it delves deep into this futuristic world and the plot hooks you in, and goes in some very interesting directions that you might not expect. There are elements from other time travel movies for sure (Terminator 1), but the film certainly holds its own as a remarkable piece of science fiction storytelling. In another collaboration with Johnson following 2005’s Brick, Joseph Gordon Levitt is terrific as the younger version of the film’s main character Joe. He has that cold and ruthless trait about his personality that helps him in this crazy job that he does. Similarly Bruce Willis is also first class in his role as the Older Joe. He’s a man who clearly believes with age comes experience, and watching these two on screen together, is insanely gripping and mental to watch. The make up to make JGL look like a young Bruce Willis is tremendously well done, to the point where you actually believe that he IS a young Bruce Willis. The arrival of Emily Blunt’s character on screen ensures the plot takes a very interesting turn, and she too gives a wounded, yet powerful performance. However, despite all the interesting timey wimey time travel elements to the story, there’s plenty of fist flying and guns blazing to get the pulses racing. The story is paced for the most part very well, although there are moments where it does lull for a little bit, but never for any substantial period of time. The film looks incredible as well, the world of 2044 although we haven’t seen it yet (unless you’re reading this in 2044!) looks very detailed and futuristic. What’s more the action scenes looking crisp and are edited supremely well with superb cinematography. If Looper is the film that ensured that Star Wars: Episode VIII was put into the hands of Rian Johnson, then you have to say, Bravo! As it means the next instalment in a galaxy far, far away is in very capable hands. A very unique and creative story with some superb writing, directing and acting especially from JGL and Willis, ensured that Johnson is a director to keep a firm eye on.